It’s getting darker earlier, colder and wetter outside, meaning the daily commute is an even tougher ordeal than usual. Spending sprees and work piles are growing in the build up to Christmas, and requests on your time seem limitless. All of this can get even the hardiest of us down! Thankfully, there are plenty of small touches you can add to your work environment to see you through to the big Spring clean. As an employer or manager, implementing these morale-boosting gestures can go a long way to show that you care. Why not try out these easy, low-cost ideas to spruce up your space and reap the rewards? Everyone loves a nice clean space and plants do a great job of adding to that fresh and bright feeling. Get rejuvenated by adding in some greenery and brightly coloured plant pots. Real or fake will do. However, if you choose the living variety, there have been many studies on the great impact these have on lifting mood and productivity. Dr Chris Knight and colleagues at Exeter University found that employees in a call centre were 15% more productive when house plants were added to their work environments. Trying to motivate yourself to work in a dirty or unclean environment can be a demoralising experience. Make sure you contact a professional cleaning company to keep the office tidy at regular intervals, and to give the space a deep clean once every few months. This will ensure your employees will thrive in a professional and tidy environment. Getting into the spooky and festive spirit can also help cheer up your space. Halloween and Christmas decorations can be minimal but still help with team bonding and morale. Let the team take the lead on decorating. Having a short break to put them up together is a fun activity shared by all. Especially in winter when there is so little daylight, fluorescent strip lighting can be rather grim, and a strain for the eyes to boot. Research by Mirjam Muench uncovered that those with little or no access to natural daylight struggled with their work by 4pm, more so than their sun-bathing peers. Switching to desk based task lamps and swapping expensive traditional bulbs with cool-toned LED ones can create a fake-but-effective daylight effect. Many offices offer the standard hot drink fare, teas and coffees, but why not go that extra step further and start adding in extra vitamins to your office kitchen? Staff are sure to appreciate a small basket of cold and flu remedies, herbal teas, or even a bowl of fruit. During the festive period you could even introduce some syrups, marshmallows and hot chocolate – get cosy for your next progress meeting! For lunchtime, hit two birds with one stone. Get a few office umbrellas made up that showcase the company branding. Staff can pop out, stay covered, and promote the company logo. With the dismal weather and brewing festive feeling, this time of year is really a great time to bring employees closer together. Making friends at work has been shown to reduce stress, and everyone loves a happy hour! Why not introduce a Friday bottle of bubbles to thank staff for their hard work that week? There are often plenty of supermarket deals in the run up to Christmas and New Year and staff can learn more about each-others work with a 4.30pm office soiree. Get your heads together and organise some charity work for your community, or one further afield. You could prepare a bake sale, take part in the Shoebox Appeal or collect a list of donation items for the local food bank. Every little helps and it will generate a great buzz in the office to give back at Christmas time. 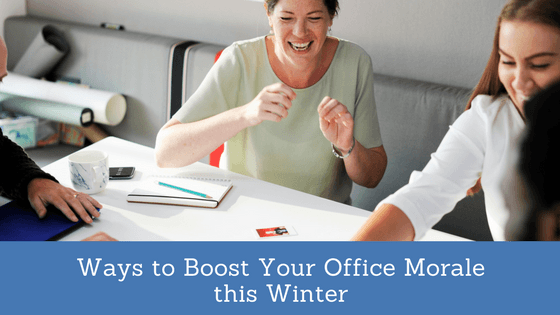 Give these simple, fun and effective ideas a go this winter season and not only see morale improve, but productivity too! Chris Smith is a Glasgow based writer and blogger. On his website Spend It Like Beckham, he writes about sport and finance. He has been previously published in the Guardian, the Huffington Post and the Telegraph. How often should you clean your mattress and bed linen?